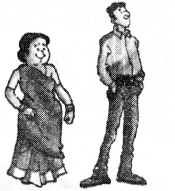 NCERT Solutions for Class 2 English Chapter 20 Strange Talk are part of NCERT Solutions for Class 2 English. 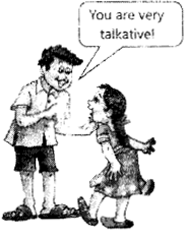 Here we have given NCERT Solutions for Class 2 English Chapter 20 Strange Talk. This poem gives us the knowledge about the names of home of different animals. It also tells us how the different animals talk. At last, poet left us with the question that if they all speak together then they would not make any noise? यह कविता हमें विभिन्न जानवरों के घरों के नाम के बारे में जानकारी प्रदान करती है। यह हमें यह भी बताती है कि अलग-अलग जानवर कैसे बात करते हैं। अंत में कवि हमसे यह प्रश्न करता हैं कि यदि सभी जानवर एक साथ बोलने लगेंगे, तो क्या वे शोर नहीं मचाएँगे? And all of them tried to speak at once. Wouldn’t it make a noise? तो क्या वे शोर नहीं मचाएँगे? 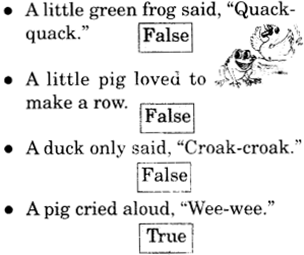 Are these sentences true or false? ये वाक्य सही हैं या गलत? Seema talks a lot and her brother calls her ‘talkative’. Do you think Seema should talk? सीमा बहुत ज्यादा बोलती है तथा उसका भाई उसे ‘बातूनी’ कहता है। क्या तुम ऐसा महसूस करते हो कि सीमा को बात करनी चाहिए? (i) When the teacher is teaching in class? जब शिक्षक कक्षा में पढ़ा रहे हों? (iii) While she is eating? जब वह खा रही हो? (iv) When mother asks her about what happened in school? जब उसकी माँ उससे यह पूछती है कि उसके विद्यालय में क्या हुआ? (i) What is your name? (ii) How old are you? (iii) When do you play? (v) Where do you live? (i) Is: He is a boy. (ii) Are: Eesha and Anisha are friends. (iii) Have: I have two pencils. (iv) Has: He has a new toy car. (v) Had: We had pizza last evening. Write five lines on ‘My Pet’. (i) I have a pet dog. (ii) His name is Shanky. (iii) He is so healthy and active. (iv) He loves me very much. (v) I often play with him. Why can’t we all be like that wise old owl? Look a the pictures and tell a story about the Takative Tortoise. This story is about three friends. Two birds and a tortoise. The tortoise is very talkative. They all are very good friends. On day they all decided to go somewhere. The tortoise moves very slow, so they decided to take him with the help of wooden stick. 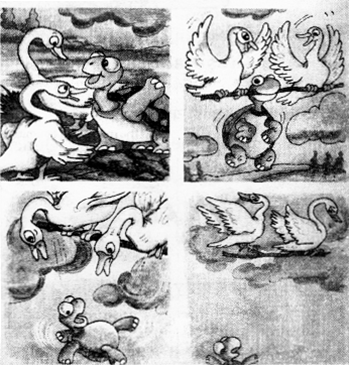 Tortoise held the stick in his mouth and birds carried the stick by holding it by both its ends. On the way, the talkative tortoise suddenly opened his mouth to say something. He lost the grip and fell on the ground and finally died. The two birds became shocked. 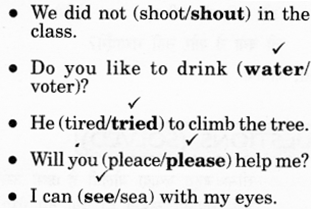 Copy each question and then choose the right answer from the red box. One has been done for you. 1. Is the man tall or short? 2. Is the woman tall or short? 3. 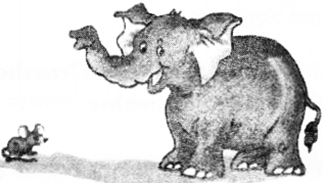 Is the elephant big or small? 4. Is the mouse big or small? 5. Is the tree green or red? 6. Is the house green or red? 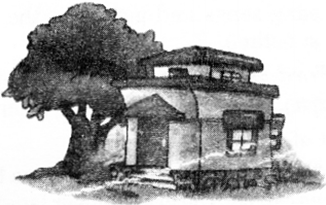 We hope the NCERT Solutions for Class 2 English Chapter 20 Strange Talk, will help you. If you have any query regarding NCERT Solutions for Class 2 English Chapter 20 Strange Talk, drop a comment below and we will get back to you at the earliest.